Includes Vaux speaker dock only. Amazon Echo Dot, power adapter and micro-USB cable not included. Amazon Echo Dot Gen 2. Compatible with Amazon Dot Echo (2'nd Generation). Dual 52mm Drivers and a passive radiator for impressive sound and bass. Opened and tested. Brand New. Amazon SB210 Bluetooth Sound Bar - Black. Tested and works great!! Optical & power cable included. Pe rfect for your 2nd generation amazon echo dot only. Very nice speaker for the amazon echo dot. Ninety7 Vaux High Performance Portable Speaker Dock for Amazon Echo Dot Gen 2. Box has been opened, but item was never used. Diameter: 106 mm/4.2” Height: 163 mm/6.4” Inputs: 3.5 mm Aux, Micro USB Included: Vaux speaker dock and Quick Start Guide only. Amazon Echo Dot, power adapter and micro-USB cable not included. Shipped with USPS Priority Mail. Plug-in internal connectors. Compatible with 2nd Generation Dot; 3.5mm plug. The doctrine is also referred to as the "right of first sale," "first sale rule," or "exhaustion rule.". Condition: used in good condition, fully tested and functional. box is in distress. With VAUX, we've made set-up a breeze. Just plug, play, enjoy! For step by step set-up, view the how to video on Ninety7's website. Overview :VAUX is a perfect battery-powered speaker. Simply place your Dot into the top of the VAUX, plug in internal connectors and you're good to go. VAUX is the first battery-powered speaker to house the Amazon Echo Dot. Plug, play. Compatible with Amazon Dot Echo (2nd Generation). VAUX Home Portable Speaker Dock for Amazon Echo Dot Gen 2 . Amazon Echo Dot sold separately. Battery life 6hours with a full charge. Box is opened but never used. Ask Alexa to play music from Amazon Music, Spotify, Pandora, iHeartRadio, TuneIn and SiriusXM. Listen to hundreds of other streaming services with the Sonos app. Set-up is quick and easy. Download the Sonos app, connect Beam to power and your TV, then follow the app instructions. Plug-in internal connectors. Compatible with 2nd Generation Dot; 3.5mm plug. All of our electrical products that plug into the wall unless otherwise noted are designed to work on the standard USA electrical system which is single phase 110V 60Hz, to be used in a foreign country that uses a different system you will need to use an international converter in most cases. 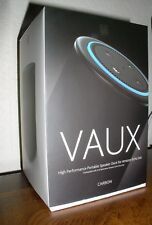 VAUX HIGH PERFORMANCE PORTABLE SPEAKER DOCK FOR AMAZON ECHO DOT. (COMPATIBLE WITH 2ND GENERATION AMAZON ECHO DOT ONLY). Plug, play. From the Manufacturer. Item model number: Vaux Carbon. NOTE: Refer the Instructional Video from the Image Section and the User Manual before use which is highly essential. Dual 52mm Drivers and a passive radiator for impressive sound and bass. Just say it to play it with BLAST from Ultimate Ears. Enjoy fast, seamless music streaming and a bigger range to roam and dance. Anyone can DJ. And even take calls without stopping the music and killing the vibe. Color:Black/Carbon | Style:Vaux Speaker Only VAUX is the first battery-powered speaker to house the Amazon Echo Dot. Plug, play. From the Manufacturer. 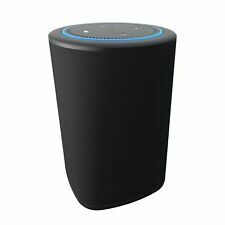 Ninety7 Vaux Cordless Home Speaker and Battery for Amazon Echo Dot Gen 2 - Black. Condition is New. Shipped with USPS First Class Package. Set-up is quick and easy. Download the Sonos app, connect Beam to power and your TV, then follow the app instructions. Manufacturer: Sonos. Experience rich, detailed sound that fills the entire room. VAUX is the first battery-powered speaker to house the Amazon Echo Dot. Plug, play. Manufacturer Model:Vaux Carbon. Compatible with Amazon Dot Echo (2nd Generation). NOTE: Refer the Instructional Video from the Image Section and the User Manual before use which is highly essential. Compatible with Amazon Dot Echo (2nd Generation). Item has been used before - Item will show signs of usage (light scuffs, wear marks, etc. )Item DOES NOT POWER ON, and is being listed AS IS/FOR PARTS. Ninety7 - VAUX Carbon Speaker Dock for Amazon Echo Dot Carbon. LOT of 4 FOR PARTS NO POWER. VAUX is the first battery-powered speaker to house the Amazon Echo Dot. Plug, play. Compatible with Amazon Dot Echo (2nd Generation). NOTE: Refer the Instructional Video from the Image Section and the User Manual before use which is highly essential. Compatible with Amazon Dot Echo (2nd Generation). NOTE: Refer the Instructional Video from the Image Section and the User Manual before use which is highly essential. Color:Black/Carbon | Style:Vaux Speaker Only VAUX is the first battery-powered speaker to house the Amazon Echo Dot. Plug, play. From the Manufacturer. Item model number: Vaux Carbon. NOTE: Refer the Instructional Video from the Image Section and the User Manual before use which is highly essential. VAUX is the first battery-powered speaker to house the Amazon Echo Dot. Plug, play. Plug-in internal connectors. Compatible with 2nd Generation Dot; 3.5mm plug. Dual 52mm Drivers and a passive radiator for impressive sound and bass;Silicone cover. Learn MoreItem model number: Vaux CarbonBatteries: 1 Lithium ion batteries required. (included).